It's easier for elected officials and CDOT to hype a silver bullet fantasy than to enact politically challenging policies that will actually solve transportation problems. 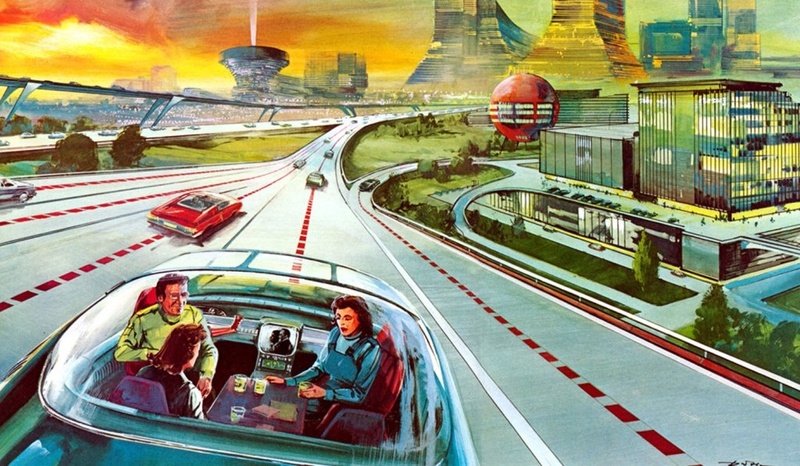 In April, Angie Schmitt wrote an article for Streetsblog USA headlined, “Is Your Local Government Falling for the Hyperloop Fantasy?” Fast forward a few months and Coloradans are nodding furiously. The Colorado Department of Transportation is helping two private companies — Hyperloop One and Arrivo — with untested transport tech that will purportedly sling people and goods along at speeds between 200 and 700 mph. Earlier this year, CDOT teamed up with infrastructure consultant AECOM, the City and County of Denver, and the City of Greeley to apply to Hyperloop One’s “Global Challenge.” The consortium pitched a $24 billion, 250-mile “Rocky Mountain Hyperloop” system that would carry 28 million trips a year by 2020 [PDF]. No joke. Hyperloop One selected CDOT’s proposal as one of 10 finalists. That means CDOT is now devoting staff time to explore the feasibility of an electrified vacuum tube between Cheyenne, Pueblo, and Vail, with a stop at Denver International Airport. Pods with people inside would reach up to 700 mph. CDOT spokeswoman Amy Ford told Streetsblog the agency is “sober” about the challenges of the project, and that Hyperloop One now aims to merely break ground by 2021. Apparently one novelty agreement to build wildly unrealistic transport technology isn’t enough for CDOT. Last week the agency announced a partnership with Arrivo, which claims its magnetic levitation track will herald “the end of traffic.” Arrivo says it will safely operate at 200 mph and is aiming to cover shorter distances than Hyperloop One. A marketing video the company put out last week pictures the system as a high-speed conveyor belt for cars along the freeway. You may have some questions at this point. Like, what’s the appeal of getting flung around a highway median at nauseating speed? And aren’t those Arrivo vehicles pretty big and bulky? Won’t they create the same congestion problems as cars? How does that help cities, where safe walking conditions and spatially efficient transit vehicles are the key to moving large numbers of people? Whatever the answers, CDOT is going to pay to find out. Ford said the agency has committed $200,000 in taxpayer dollars to study the Hyperloop One and Arrivo concepts. But the problem is bigger than the $200,000. The fact that Colorado agencies are spending any time and attention on these fantasies is a sign of how unserious they are about solving real-world transportation problems. To help city residents get where they need to go, Colorado needs to prioritize buses and trains. We need to encourage compact development patterns where walking and biking are convenient options. These things aren’t always easy, but they’re proven to work. The same can’t be said for what Hyperloop One and Arrivo are peddling. By the way, some useful background: Arrivo is run by Brogan BamBrogan (yes, his legal name), who co-founded Hyperloop One but split with his former partner, Shirven Pishevar. BamBrogan sued Hyperloop One, alleging assault and labor law violations, according to Wired. Hyperloop One’s countersuit claimed BamBrogan and his crew stole company computers and proprietary data, and even forged a Twitter account to make Pishevar and Hyperloop One look bad. Both sides settled out of court for an undisclosed amount of money. Governor Hickenlooper, Mayor Hancock, and CDOT have three words for these startups: Welcome to Colorado! There’s this thing about technology. It requires R&D. That stands for “research and development.” Things like the diesel engine, the interstate highway system, and electric trains don’t just magically spring into existence, fully formed from the mind of some Holy Transportation Engineer. They require R&D. Someone has an idea, they test it, they learn from the test and tweak the idea, then they test that new idea. Does this research and development happen at the exclusion of implementing existing technologies? Of course not! And nobody involved with these test projects is saying it should. So why are you pretending like you can have one or the other, but not both? People, especially people in government who make procurement decisions, need to be able to spot a con. These companies are obviously peddling fictitious products that would serve no useful purpose even if the fictional technology were to suddenly be conjured into existence. They are not inventing the next revolutionary transportation solution. They are playing people for suckers. We don’t need a $24 billion vacuum-sealed tube slinging people to Wyoming and back. How ’bout that boondoggle of a new airport DIA or DEN? It provides the 19th largest MSA the 5th highest passenger traffic and nothing has been more critical to Denver’s economy. Or how ’bout that public squandering of money on Coors Field the single biggest catalyst for downtown at the time. Etc etc. So you think we do need a $24 billion vacuum tube slinging people to Wyoming and back? Cool. You’re putting the cart WAY before the horse. Let’s see if the test even works first. Then ask how much it costs. Then ask if the benefits are worth the costs. If you’d asked Thomas Jefferson to invest $114.3 billion building asphalt roads out to the middle of nowhere, he’d say using bituminous rock to make a road sounds like a stupid idea – what’s wrong with the current technology of mud and straw, or cobblestones? Besides, who the hell needs to go to Wyoming and back in only four days? Can you tell me what problem you think these technologies will solve? Good question. Asphalt doesn’t solve any problem. Since horse-drawn wagons have a top speed of 10 mph, cobblestones are just fine. I’m talking about Hyperloop and Arrivo, not your whatabouts. Same here. Do you understand the metaphor? It’s an analogy, not a metaphor. And it’s a poor one. Asphalt solved problems with the durability and maintenance of macadam roads, not cobblestones. But no one on this thread can even articulate a real need that these products will address. We’re in bad shape if people can’t distinguish between legitimate, productive research and hucksters like Hyperloop and Arrivo. OK, could you list a few legitimate, productive research projects CDOT should be cosponsoring? the concept does NOT even reduce motor traffic congestion. The cars still need to be stored and still consume huge amounts of street space. It’s so mind boggling idiotic to be funny. YES!!!!!! The long term goal of Hyperloop One is to build a nationwide network of tubes capable of sending pods between major cities at top speeds of 700 MPH. Since the mountains of Colorado are too high in elevation, and the cost of building a Hyperloop One tube across the mountains at this current time (this problem might be solved by Elon Musk’s Boring Company) are bout way too time consuming and expensive, then a spur line from Cheyenne to Pueblo makes more economic sense. The possible Hyperloop One Transcontinental Trunk Line could potentially start in NYC, got through Philadelphia, Pittsburgh, Columbus, Fort Wayne, Chicago, the Quad Cities, Des Moines, Omaha, Lincoln, Cheyenne, with the Transcontinental route splitting in Salt Lake City by either going towards the Northwest US via Boise or southwest to Los Angeles via St. George and Las Vegas. DIA was built before the Wright Brothers? Coors Field before Cooperstown? Heavier than air flight and baseball were research projects funded by Colorado taxpayers? I could put it into language that even a 4th grader could understand but I suspect that’s not the problem. One of the more famous supporters of more recent research and development signed a Bill into law Feb 17, 2009 which was larded up with pork for R&D. Research & development has been the mother’s milk of the American economy forever. But there has also always been naysayers. Does that help? What tax supported R&D of unproven technology with debatable goals went into DIA or Coors field? Your logic in this case is bad and the examples you provided. I assume you mean “What spending supported…” Make a spreadsheet of the hundreds of millions of R&D money that flowed from the ARRA and get back to me. Conservatives would quickly point to Solyndra. They weren’t the only company that crashed and burned from tech that wouldn’t work. The important point is that through the boatloads of money injected into renewables eventually the best survived and costs were cut in half for solar and wind energy over several years. Would you not assume that a gazillion $’s were wasted on the way to today’s computer world? C’mon, clearly DIA and Coors Field have nothing to do with tech. Rather it makes the point that Negative Nancy’s and Naysayers have always been among us and many times they are proven wrong. You’re pretending not to see that is silly. Every awesome thing about our lives that we now take for granted began with a fantasy-idea. Add boatloads of gov’t cash for R&D and over time you end up with trains, planes and automobiles. But that’s not the half of it. What would life be w/o computers or life-saving medical care. After initial nurturing by gov’t agencies then the private sector comes in and runs with it by perfecting things in all manner of ways. The biggest source for various new tech has surely been DOD but other agencies like NASA and NIH etc have also made yuge contributions. Right, a concept fed by money and science is the way to the future. Clearly pursuing pipe dream projects like these do occur to the exclusion of existing technologies given that CDOT is unable to operate affordable buses to the mountains or along the front range cities, let alone a train. It’s nice to support research and development, but not by gambling your city’s infrastructure money and even safety. Colorado will not benefit from being a corporation’s guinea pig. Any deaths, disasters, and losses of property in the testing phase will occur in Colorado. Even if the technology proves successful, the newer models, the ones based on learning from the mistakes in Colorado, will be built in other areas. Corporations should be building on their own land first, with their own money. Couple of finer points: CDOT represents the State of Colorado and is but one of ten finalists but assuming Colorado is used then yeah your point is fair. Getting a bunch of college students together is your idea of R&D? That’s not R&D its a science fair project. Ever use email or Google or a website? All invented by college students. But keep repeating your misleading awesome sound bite. The internet was invented by private companies working with government and university researchers, not college students. Students did not invent the hyperloop either which can’t even be called an invention. An invention has to be proven to work. The hyperloop has not been proven to work and yet the people supposedly building it claim that it does work. A 75mph sled is not proof of anything. Of course things need research and development, so why not unveil this to the public when it’s actual viable instead of making it seem like this is coming soon. All the tests I’ve seen so far are failures. The Hyperloop is nowhere near becoming a reality. The only people making it seem like this is coming soon are the media. If that’s your complaint, it’s one for Streetsblog and the more traditional news outlets, who, in an effort to get eyeballs and clicks, have hyped this as something more than a PPP field test. No. CDOT, the state transportation agency, said in its proposal it would be up and running in a couple years. Now CDOT says it will break ground in a few years. AECOM’s proposal for the Rocky Mountain Hyperloop is a mess. I don’t know how much of a seal of approval CDOT put on it, but it’s not even internally consistent, stating in one place (page 2) that ridership of just the Accelerated Phase 1 (Denver to Greeley) will be “28 million trips in 2020″ and stating in another place (page 15) that all of the Front Range corridor has a”demand in 2035 of 13.8 million riders per year.” However, my comment was intended to be about the Arrivo test track, which seemed to be the main new news in this article. It’s sounding like Lyle Lanley selling monorail more and more every day. There’s even an alliteratively-named character peddling a futuristic transit system. I feel like if we weren’t a state with TABOR holding us back, I wouldn’t be so bothered with wasting state money on this, but this is something that a state with breathing room should be perfecting before we jump on the hype-wagon. Unfortunately, CDOT should be spending money on systems that are proven effective at easing transportation burdens before spending on something like this, especially considering the growth rates of both population and tourism throughout the state. Thank God we live in America. While ‘hucksters’ and naysayers have always existed it’s only in America that the hucksters were able to create the most dynamic economy and society the world has ever known. Motor traffic congestion is not a technical challenge; it’s a land use challenge. Private Cars are rapacious users of scare land. Private Cars require vast amounts of land for movement & storage. Let’s talk politics. When discussing Pres Obama’s accomplishments or lack thereof depending on your political biases you get all manner of political dribble. But it’s real simple. In addition to saving the country’s bacon his real accomplishments came out of the ARRA and are seldom mentioned. Top of the list is renewable energy whose costs were subsequently cut in half. In Colorado, Xcel Energy now plans to generate over half of Colorado’s electricity within about ten years. Thank you Pres Obama. Second is the yuge support of transit. Thanks to nearly $2 billion in Federal support Denver is completing FasTracks. Thank you President Obama. Third on the list is harder to define but it’s simply the spreading of copious amounts of R&D cash among gov’t agencies and Universities. Research and Development, which Pres Obama believed deeply in, is the mother’s milk of what has made this country so great. I agree wholeheartedly with ToddBradley. Good to see nobody in their commercial wearing seatbelts while traveling at 300 mph. they are having soooo much fun !!!! Thanks for writing this up, Dave. Still feels a little bit like “Who needs railroads? Horses have worked for centuries!” but I can also understand why you’d want this to remain a private endeavor, free from taxpayer support. We have technology that goes 200 mph and faster. Trains. We have buses that would be much faster and more efficient with their own right of way. What we don’t have are public officials and agencies willing to repurpose right of way currently used for cars. You think CDOT will plop a 24-7 bus lane down on Federal? These are today’s problems. Rather than dealing with them, CDOT and its enablers are changing the subject. We agree about the problems, I think, but disagree that CDOT’s focus has to be either/or. I’d like CDOT to prioritize transit on Federal AND explore Arrivo/Hyperloop as alternatives to freeways. Granted, I’m not wild about Arrivo’s “We can make you and your car go real fast!” vision, but if these companies can get CDOT excited about something that’s not a road, I’ll take it. why not explore removing existing urban freeways and restoring the pre-existing street grid ? Trains are a joke, AND to be fair, unsafe. OTOH, Arrivo, as well as hyperloop, are IDEAL for going point2point, fast, and should be safe. Arrivo is a good choice for moving cars/ppl at 150-200 from say DTC to Denver or to 160th. And Hyperloop is absolutely IDEAL for going Denver to ski resorts and even the gambling towns. Basically, moving at 700 MPH would enable us to hold a winter olympics here and still make a profit. Sadly, your english degree and lack of science/engineering, really does not help you in making intelligent choices here. Ah, ‘unsafe’ is a relative assessment of risk. Train travel is the safest way to travel in the U.S. (depending how you classify 9/11). Trains in Europe have automobile wagons. They are very rare and most travelers don’t use the service. Instead of trying to reinvent train travel in the image of the car, why not just make train travel better? Lastly, your lacking English degree is apparent in your sentence structures. Why doesn’t your science degree better allow you to assess risk? The idea that putting vehicles on a maglev conveyor belt will “end traffic” is laughable. These companies are selling snake oil. The aura of legitimacy conferred by their arrangements with public agencies will rope in a few more investors and keep them going a little longer, but they’ll flame out within a few years, like Juicero or the straddling bus. The good news is that there seems to be little genuine risk that taxpayers will be on the hook for large sums. Still, it’s pathetic to see CDOT and others indulge these hucksters in any way, shape, or form. Stupid people that got rich, being stupoid are investing millions of dollars in thge concept, without confering with you. I am shocked. Richard Branson can afford to lose a ton of money on this, and he will. Anyone who with a straight face claims they will build something 250 miles long in basically 2 (maybe 3) years, either knows they are lying, or doesn’t know what they are saying, and shouldn’t be trusted with money to do so. Welcome to Colorado, David. The clickbait article is not about Colorado or Denver, its about fear of technology and a fear of change. These Colorado agencies are made up by elected officials and their work and decisions affect all parts of the Colorado economy. Would you not like to have elected officials make economic decisions for you because you think some of your tax dollars are wasted? That mindset is how we got TABOR. Why doesn’t StreetsBlogDenver single out TABOR more often on the blog? TABOR, and the politics around it, are the larger reason why the Colorado State Capital hasn’t invested in transit infrastructure. “To help city residents get where they need to go, Colorado needs to prioritize buses and trains. We need to encourage compact development patterns where walking and biking are convenient options. Arrivo has a great point; they offer themselves as a transportation layer. Buses, trains, walking and other modes of transit making up the other layers. If rail is already proven to work, why isn’t StreetsBlogDenver talking about Colorado Senate Bill 17-153, the Front Range rail bill? : https://leg.colorado.gov/sites/default/files/documents/2017A/bills/2017a_153_signed.pdf Shouldn’t StreetsBlog Denver make civic information about a front range rail corridor more public? What is the motivation not to talk about the Senate Bill? If Colorado is to remain competitive as a state, we need to attract investment and talent. People like the author David who moved here recently, were brought to Colorado for some reason. Throwing future people who are going to move to Colorado to work in a new infrastructure technology industry, under the bus, is definitely not helping to fix or improve infrastructure in Colorado. Arrivo would increase motor traffic congestion. on city streets and in parking lots. How exactly would Arrivo increase motor traffic congestion? You obviously have no read what Arrivo does. It is both a train, and a car hauler. The bus is for inner city. The car hauler is to move it from 1 edge of the city to another. Arrivo will actually improve things, not make them worse. that’s actually even worse for motor traffic congestion. This is an article that really shows why America, including Colorado, has fallen behind. We constantly have ppl that fight against making changes while China and Europe are moving ahead of us. Thank you, great point. According to Bloomberg, China had spent $1.4 trillion through Oct (2016) on infrastructure. https://www.bloomberg.com/news/articles/2016-11-13/china-trumps-trump-when-it-comes-to-infrastructure When it comes to transit China easily out distances us not only with investment but also with R&D. this a great idea ! reallocate existing motor lanes on superhighways to rail. Don’t existing trains already have their own dedicated lanes? That’s not what’s unique about the above. No one in Europe is talking about Hyperloop. No one. It would behoove you to give that some thought.